Oh, and in a short follow up to the travel part of my previous post – after trying to book no less than 10 hotels in Paris, and having the price jump significantly on the checkout page I got fed up and quit. This means I’ll be landing in Paris with no solid plans for a place to stay, at least as of this moment. I’ve got a few offers from folks who live in/around Paris to crash at their houses but I don’t know if those are going to be convenient to LeWeb3 at all, and while that’s a better option than sleeping on a park bench, spending assloads of cash on taxis defeats the purpose of not staying in a hotel. So, any friends, neighbors, countrymen who are already set up and booked at hotels in/near/around the LeWeb3 conference in Paris who have an extra bed, couch, floorspace that they’d be willing to share, please let me know. I’ll happily chip in for the cost of the room, I just couldn’t deal with jumping through any more hoops today. That said, I land at 5:30pm ish – should I go straight to the conference hall or somewhere else? I checked FaceBook but all the events listed seem to start at 8am so I’m sure I’m missing something. FWIW, if a spare couch/room plan doesn’t pan out and you go back to looking for hotels, when we were in Paris last spring, we stayed at the Hotel de Notre Dame St. Michel (http://www.hotel-paris-notredame.com). Nice little place. Oooo and here’s another last ditch idea! About a halfblock away from that Hotel Notre Dame is the Shakespeare & Co. bookstore, which is known for providing rooms to struggling/traveling/starving writers (bloggers count I’d think). Might be worth checking out if you end up in the vicinity. 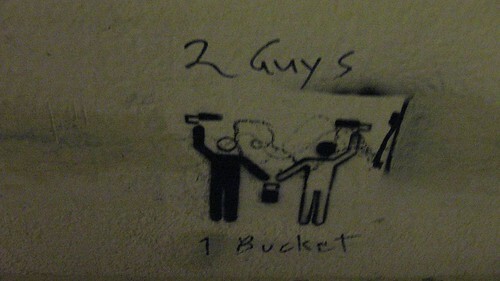 2 guys… 1 bucket… but what are they holding in their other hands?